President Donald Trump defended his treatment of Christine Blasey Ford, the woman who accused now-Supreme Court Justice Brett Kavanaugh of sexual misconduct, saying that the judge would never been confirmed if Trump didn't go on the offensive during the nomination. "Had I not made that speech, we would not have won," Trump told '60 Minutes' host Lesley Stahl in a sweeping interview that aired Sunday. "I was just saying she didn't seem to know anything." Trump openly questioned Ford's claims and mocked the broader #MeToo movement during a rally in Mississippi, just days after the woman gave emotional testimony about her allegations before the Senate Judiciary Committee. Ford alleged that a "stumbling drunk" Kavanaugh sexually assaulted her when they were both teenagers at a party in the 1980s, pinning her to a bed and attempting to remove her clothing. The judge vehemently denied the allegations, including those from two other woman who publicly came forward with similar accounts of sexual misconduct. He was confirmed earlier this month in a slim 50-48 vote. Stahl asked several times if the president had to make fun of and mimic Ford, but Trump claimed that he didn't do so and said supporters at his rally who laughed at his remarks could do what they liked. "You know what?" the president countered, "I'm not gonna get into it because we won. It doesn't matter. We won." During the rally, Trump lambasted Ford's recollection of the event, alluding that because she couldn't remember the exact address of the party, she couldn't positively identify the man who assaulted her. 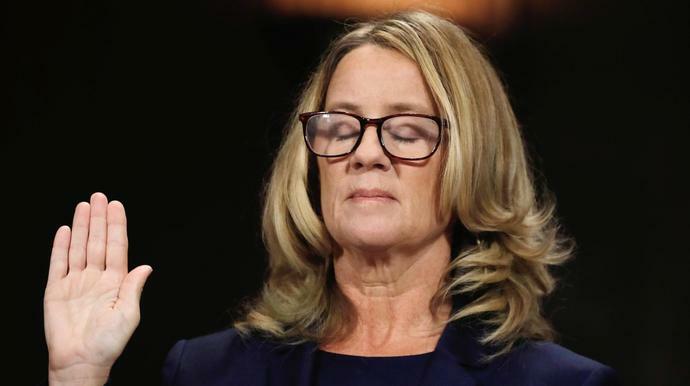 Ford said she was "100 percent" certain it was Kavanaugh who held her down. ″"I had one beer, right? I had one beer! How did you get home? I don't remember. How'd you get there? I don't remember. Where's the place? I don't remember," Trump mocked. "Upstairs, downstairs, I don't know. But I had one beer. That's the only thing I remember."